The Weight Watcher: Does Dukan work? Expert says: Dukan diet "not a sustainable option"
Does Dukan work? Expert says: Dukan diet "not a sustainable option"
Fancing giving your diet the royal treatment? Well, sources are reporting that Kate Middleton's rail thin wedding day appearance was down to following the French diet plan. The Dukan Diet's been big in celebrity circles for some time with celebs like Jennifer Lopez rumoured to be following the high protein, low-fat plan. "The Dukan Diet is a high-protein, low-carbohydrate diet and is not a sustainable option in the long term," says accredited practising dietitian Jemma O'Hanlon. "Whenever I hear of someone going on a diet, I always ask them whether they think they will be able to stick to this diet for the rest of their life. If the answer is no, then I ask them why they would choose to commence a restrictive diet that they can't maintain. "The Dukan diet is an example of one of these. It may not appear as restrictive as other diets, such as the Atkins or the lemon detox diet, as over time it allows you to have more choice about what you can eat. But in the end the outcome is likely to be the same. "The Dukan diet starts you off on a very restrictive eating plan. The first phase, the Attack Phase, requires you to consume only lean meats, fish, eggs and low-fat dairy. "Basically this sends your body into a state called ketosis, where your body starts breaking down its lean muscle mass to use as energy. This is because it is starved of carbohydrates that would usually supply the body this fuel. 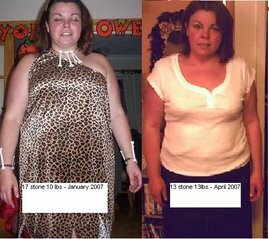 You are guaranteed to see immediate weight loss because your body is forced to break down muscle. Fluid losses also result in order to flush the ketones out of your system, and these losses will also show a reduction on the scales. "I would not recommend the Dukan diet. Going on any diet means changing your normal eating habits to something that is unfamiliar and unnatural." Those last few words are those to live by!! As soon as I hear the words 'you can't have...', you should really think twice about whether this eating regime is in your body's best interests. A survey of nearly 5000 ''Dukanians'', as they have been nicknamed, found that 80 per cent regained the weight they lost within three years, and experts who analysed the results of the survey claimed it was a ''public health risk''.